4. 275,000 from the North Border regions of England, Scotland, and Ulster to the backcountry of New England, western Pennsylvania, and the Appalachians, 1717--75, to escape the endemic conflict and poverty of the Border regions, and especially the 1706--7 Act of Union between England and Scotland, which brought about the "pacification" of the border, transforming it from a combative society in need of many warriors to a commercial and industrial society in need of no warriors, with the consequent large-scale displacement of the rural population. ・ Fisher, J. H. "British and American, Continuity and Divergence." The Cambridge History of the English Language. Vol. 6. English in North America. Ed. J. Algeo. Cambridge: CUP, 2001. 59--85. The English language which the settlers carried along with them was, of course, that of England. The colonists surely brought various regional forms, but it is generally accepted that the largest number of those who arrived came from southern England. Baugh (1957) concludes --- on the limited evidence of 1281 settlers in New England and 637 in Virginia for whom records exist for the time before 1700 --- that New England was predominantly settled from the southeastern and southern counties of England (about 60%) as was Virginia (over 50%). Fisher's figures indicate that 20,000 Puritans came between 1629 and 1641, the largest part from Essex, Suffolk, Cambridgeshire, and East Anglia with fewer than 10% from London, and that 40,000 "Cavaliers" fled especially from London and Bristol during the Civil War and went to the Chesapeake area and Virginia (Fisher 2001: 60). The Middle Colonies of Pennsylvania, new Jersey, and Delaware probably had a much larger proportion from northern England, including 23,000 Quakers and Evangelicals from England, Wales, Germany, Holland, and France. Over 250,000 from northern England, the Scottish Lowlands, and especially Ulster settled in the back country . . . . In each of the areas settled the nature of the language was set by speech patterns established by the first several generations. ・ Baugh, A. C. A History of the English Language. 2nd ed. New York: Appleton-Century-Crofts, 1957. 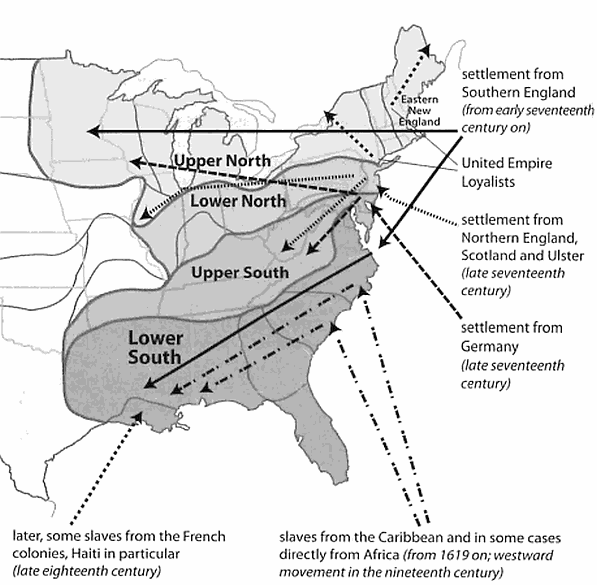 Research carried out in the 1990s appears to suggest that, even if AAVE is descended from an English-based Creole which has, over the centuries, come to resemble more and more closely the English spoken by other Americans, this process has now begun to swing into reverse. The suggestion is that AAVE and white dialects of English are currently beginning to grow apart. In other words, changes are taking place in white dialects which are not occurring in AAVE, and vice versa. Quite naturally, this hypothesis has aroused considerable attention in the United States because, if true, it would provide a dramatic reflection of the racially divided nature of American society. The implication is that these linguistic divergences are taking place because of a lack of integration between black and white communities in the USA, particularly in urban areas. 1. The original extent of the US according to the Treaty of Paris at the end of the War of Independence in 1783 extended to the Mississippi River. 2. In 1803 the Louisiana Purchase, the territory ceded to the U.S. by Napoleon for $15 million, doubled the territory of the US, which now reached the Rocky Mountains. 3. First West Florida (1810 and 1813) and then East Florida (1819) were taken from Spain by invasion and the payment of $5 million. 4. Texas, once a Mexican state, then an independent republic run by American settlers since 1836, was annexed by the US in 1845. 5. The Northwest Territory (Oregon, Washington, and British Colombia), claimed by Britain and the U.S. as well as Spain and Russia, was peaceably divided between the former two in 1846. 6. In the Mexican-American War (1846--1848) vast conquered areas in the west (California) and southwest (New Mexico, Arizona) were annexed. The US indemnified Mexico for $10 million. Many speakers of Native American languages and Spanish became US citizens. 7. Further Mexican territory (the Gadsden Purchase, 1853) was acquired for $10 million to ease the building of a rail line to California. 8. The US bought Alaska from Russia for $7.2 million in 1867 (Seward's Folly). The original Inuit peoples are today a distinct minority. 9. The kingdom of Hawaii (formerly known as the Sandwich Islands) became a republic after a coup by Americans living there in 1893. It was annexed in 1898. Today the Hawaiian language is making something of a comeback within a context of a society dominated by StE and Hawaiian Creole English. 10. The Spanish-American War ended with the US taking over numerous territories, some such as Cuba only temporarily, others longer. Today Puerto Rico is a commonwealth, Spanish-language American territory, and Guam in the Pacific, a bilingual territory. The Philippines, for which the U.S. paid Spain $20 million, remained an American colony until 1946. Pilipino is the national language in this very multilingual country, and English is a widely used L2. What we see, then, is economically and demographically motivated expansion and closely related to it, a geographical spread of English to a unique extent. While the other major European colonial powers, Spain, Portugal, France, and The Netherlands, also acquired colonial empires, they differed because they did not establish settler communities which repeated the process of expansion to the degree that Britain did. In the case of Russia there was "merely" what is most frequently seen as "internal" expansion eastward. And the late-comers to the field, Germany, Italy, and Japan, were able to acquire relatively few and less desirable territories and were knocked out of the game at the latest by losing World War I (Germany) or World War II (Japan, Italy). Zoologically speaking, there are no native rabbits in the United States; they are all hares. But hare to an American normally means the so-called Belgian hare, which is not a hare at all, but a true rabbit. ・Mencken, H. L. The American Language. Abridged ed. New York: Knopf, 1963.